I'm have to used magnify glass mirror to fix my face, so this product is perfect to me, because help me to apply my make up easier. GREAT WHEN IM IN A HURRY TO GO OUT. Everyone needs who wear mascara! Needed it! I'll use whenever I apply mascara! No More Looking Like a Zombie! This is so cool...I can now get full coverage on my eyelashes without looking like a zombie! 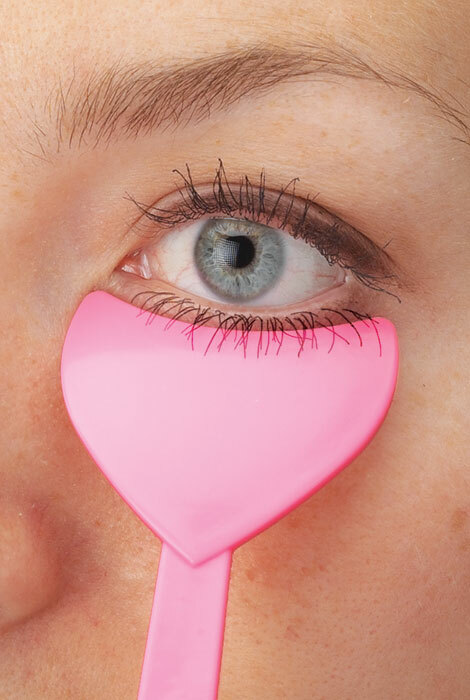 As advertised, this little gadget does keep eyelids mascara-free. Instead, of your lids being covered with mascara, as you try to reach every lash, it gets covered. Thankfully, it's very easy to wipe clean with a tissue. Although this item is marketed for use with lower lashes, I'm only able to use it on my upper lashes (cannot find a position that's close enough to my lower lash line for it to be effective). It's just too wide for use on my lowers. This could be because I'm Japanese? Also, much mascara gets transferred onto the Sheild, which I've found requires my applying a second coat of mascara. All of this said, I still prefer using the Mascara Sheild, to having to wipe off, and consequently smear, the mascara smudges. This mascara shield prevents your mascara wand from brushing against your skin during application. I was surprised to find that it also works on the upper lashes! When I put it under my lower lashes I realized I had lashes that were so sparse I hadn't been covering them (toward the inner eye area). However, while it will leave color on your lashes, if you are using a volumizing mascara you will need to reapply another coat without the shield if you want your lashes thicker looking. I thought this would help with specks of mascara on my lids/under the eye, but it doesn't. I'm not coordinated enough to hold both the device in place and apply mascara, I guess. All-- save your money. As We Change has many fine products. But This thing is not even a gadget. It smears more make-up than it collects. Poor design, poor functionality and beneath AWC standards. Way too much money for a little piece of plastic----+ the shipping for that little feather weight piece of plastic is down right ridiculous!!!!!! it is hard plastic??!! you have to be a contortionist to use it on the bottom lashes and no ones eyes are the same size or shape, so it does not work if you do not have LARGE eyes! I spent too much money on it (including shipping to find it to be utterly useless!! try actually MAKING it FLEXIBLE!! A MATCH BOOK COVER BENT IN CURVE WORKS BETTER AND IS FREE!! It is not easy to handle. Your lashes hit it and as you apply mascara, it does not function as promised. You can't use this piece of plastic under the lash and still access the lash to apply mascara. Complete waste of money, don't purchase. I cannot brush mascara on my lower lashes without a diaster. To keep the mascara off my face. Another great idea! I am forever getting my mascara on the skin on my lower lashes. I am having a difficult time putting on mascara because my hands a shaking. I constantly get smears under lower lashes. Really a joke! Would not recommend! Plus, it costs $10!! I have thin lashes so mascara tends to get on my face, hopefully this will stop that. I purchased this item as I always smudge my lower lashes when applying mascara. When I bother to use it, it does a nice job of preventing the problem. I'm a mess when putting on mascara so glad to finally see there is something that will help me out. I am always messing up under my bottom lashes. I have found a solution. I did not choose it.....and I do not need it. I'm very messy when applying mascara. Hoping this will eliminate that problem. I am tired of holding a tissue under my eyes while I apply powdery eye shadow. I had similar item years ago. It really helps to keep mascara smudges off of your skin underneath your eyes and mascara is easier to put on. to keep from putting mascara on my skin. I'm hoping it will save time on "clean-up" since my vision at near is diminishing.